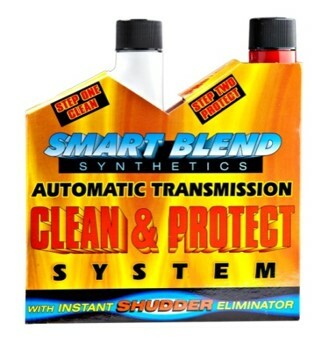 SMART BLEND SYNTHETICS Automatic Transmission Clean and Protect contains a unique Synthetic Flush (Step 1) with Molecu-Tech Technology and a Synthetic ATF Protectant (Step 2). This product insures quality, increases customer satisfaction while increasing profitability when performing automatic transmission fluid evacuation or flush services. The convenient easy to use Synthetic Automatic Transmission Clean and Protect is compatible with all OEM recommended fluids, and will not affect manufacturers limited warranties.